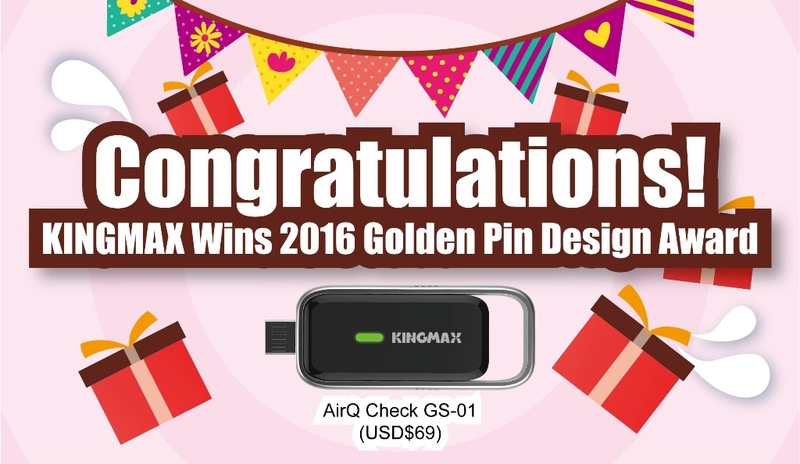 The KINGMAX "AirQ Check Air Quality Monitoring Device" has emerged from a pack of 3005 submissions to win the 2016 "Golden Pin Design Award"! The Golden Pin Design Award is the top design award in the international Chinese-speaking market. The 35 year-old award in Taiwan invites top international design experts ever year to serve as the judges for the preliminary, secondary and final rounds judging. This year's entries came from 11 countries including Taiwan, China, Hong Kong, Macau, Japan, Korea, Singapore, Malaysia, Thailand, Canada, UK, Denmark, and Switzerland. Everyone from the KINGMAX team feels honored to see the AirQ Check stand out from the many exceptional submissions to achieve international acclaim and catch the judges' attention. The "AirQ Check Air Quality Monitoring Device" is an innovative product based on the following design philosophy: Realizing the importance of indoor air quality, the KINGMAX team carried out a study and found that poor indoor air quality had a more serious impact on human health than outside air pollution. While people generally feel most comfortable at home, it may actually harbor all kinds of nasty, harmful gases that you can't smell. The fact that most people don't appreciate the importance of indoor air quality means they expose themselves and their families to an unsafe environment. This was why KINGMAX developed the "AirQ Check Air Quality Monitoring Device," which provides an electronic substitute for the human nose that can stand on guard against any objects that contain volatile gases. Even everyday items like nail polish, hand cream, cosmetics, crayons, colored pencils, air fresheners and cooking smoke can be measured to keep you safe and healthy! AirQ Check is manufactured in Taiwan using the latest MEMS semiconductor technology. It features a stylish zinc alloy casing and ergonomic sliding cover. When not in use, it can be carried wherever you go. Plug it into the mobile phone to connect to the specially designed app to see if the levels of TVOC (a combination of different gases including Formaldehyde, Acetaldehyde, Alcohol, and Carbon Dioxide) and Carbon Dioxide exceed the recommended limits. It can also detect the temperature and humidity as well. The LED indicator light on the device also changes if harmful gases are detected. Green means good, orange means average and red means danger. The app will also beep if the concentration of gases is too high to help the consumer determine the current air quality. The AirQ Check is light, portable, convenient and easy to use. Anyone can use it to keep an eye on the air quality!